Brand New Ammbusher Model T63, 63" Wide Heavy Duty Grapple/Bucket. Will fit any Skidsteer & Front-End Loader with the New Universal Skidsteer Quick Attach. * The Grapple Cylinders are completely protected with Standard Cylinder Guards to prevent cylinder damage - see photo. 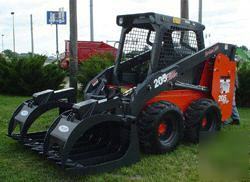 * The Grapple has a 43" Tall Maximum Opening Height. 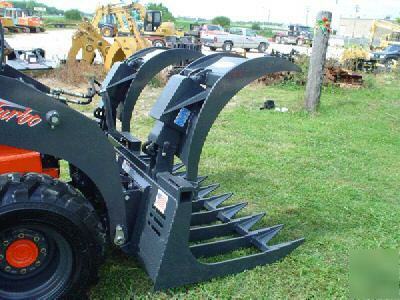 * This Grapple/Bucket has a semi-enclosed back so that you can push trees into Woodchippers without damaging the Skidsteers Tires. * Comes with a One Year Warranty. * This is a Very Heavy Duty Grapple/Bucket!!! * Overall Weight is 770lb's. 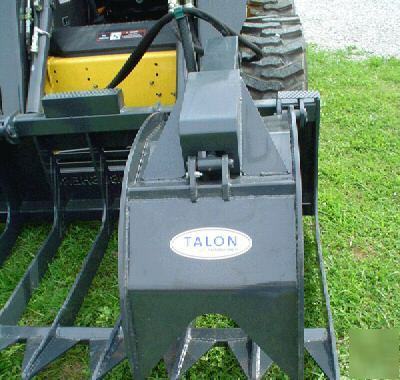 * This Grapple/Bucket comes complete with the Hydraulic Hoses & Flat-Face Couplers, it is complete & ready to use. Plus, we are glad to say, Ammbusher products are MADE IN THE USA! * For more photos and Specifications e-mail or call us at .